For Plastic, Paper, Wood, Fiber, Rubber, Organic Waste A Wide Variety Of Non-metallic Materials. Single shaft shredder is available to recycle wide range of material. It is an ideal machine for plastic, paper, wood, fiber, rubber, organic waste a wide variety of non-metallic materials. As per our customer’s requirements, such as the input size of materials. Capacity and the final output size etc. We could work out a suitable proposal for our clients. 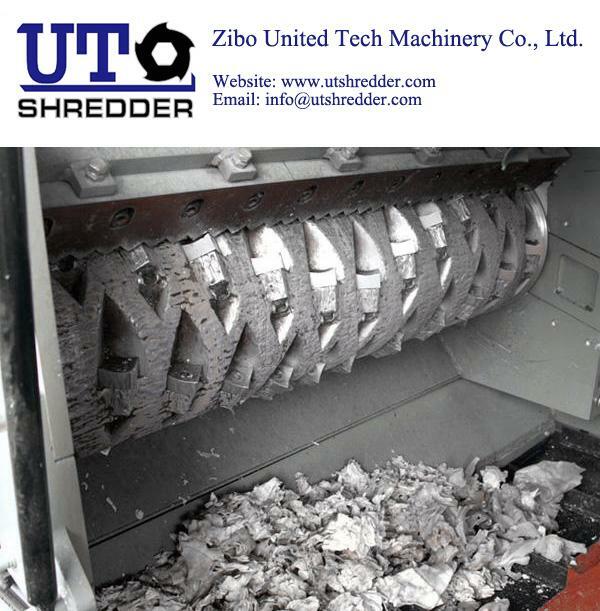 After being shredder by the machine, the output material could be used directly or go int to the next step of size reduction. With the function of PLC microcomputer control system, it is possible to control automatically start, stop. Automatic reverse sensors to protect the machine against over loading and jamming. The output capability typically range between 300kg/hr -5,000kg/hr+ depending on the different model and different materials. Application - Single Shaft Shredder in Zibo United Tech Machinery Co., Ltd.
Wood: Timber; Tree Root; Wood Pallets; Wood Package, etc. Industrial Solid Waste: Cable; Light Metal, like Aluminum Can, Aluminum Scrap, etc. White Goods, like TV Shell, Washing Machine Shell, Refrigerator Body Shell, Computer Shell, Circuit Board, etc. Solid Waste, like Household Garbage, Medical Waste, Industrial Waste, etc. Others: Rubber, Textile, Fiber & Glass Products,Paper: etc. Advantage - Single Shaft Shredder in Zibo United Tech Machinery Co., Ltd.
* Detachable Rotor Blade, easy disassemble and installation, and simple maintenance. * Automatic Feeder, increase produce efficiency. * Quick change Screen for accurate particle size control. * Shock Absorbing Gearbox reduces stress on Drive components. * Integrated Rotor, assured the cutter clearance between the Rotor Blade and the Counter Blade. * Enclosed Bearing protection design, waterproof and dustproof, extend the bearing work life. * PLC Control System, automatic reverse sensor to protect the machine against over loading and jamming. * Provide the Rotor Cooler System against the low melting materials, prevent the materials burning while the temperature higher. application: Suitable for processing a wide range of materials including: Plastic lump/purging, Plastic boards, Circuit boards, Plastic barrels, Wood, Fibre, Rubber, Films. application: for plastic, paper, wood, fiber, rubber, organic waste a wide variety of non-metallic materials.